Leo Diamond presents a beautiful 1/3ct diamond in a classic solitaire design, loved by many for its timeless appeal and how it gracefully raises the diamond into prominence. The Leo Diamond is a product of four generations of expertise in the art of diamond cutting, resulting in the first diamond that was independently certified to be visibly brighter than other diamonds with 8 additional facets compared to traditional round brilliant cut diamonds. The band is made from 18ct yellow gold, with a 18ct white gold claw setting. An extra certificate is included in your purchase to verify its superior light performance. 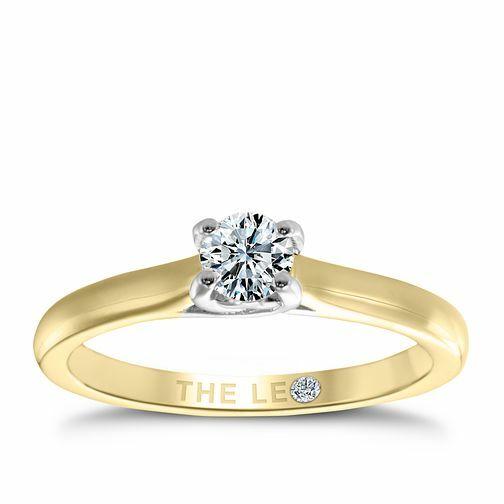 Leo Diamond 18ct yellow & white gold 1/3ct I-SI2 ring is rated 4.7 out of 5 by 3. Rated 4 out of 5 by Anonymous from excellent my dream comes true !! my husband bought it as 20 years wedding anniversary gift beautiful !!! love it too much !! Thanks to Tina shes great and very helpfull assistant manager In Ernest Jones Maidstone !! !